Ask CF: How Can I Dress to Flatter My Figure? A lot of the clothes featured on your site are very bodycon. I have a bit of tummy pudge that I am very self conscious about – how can I look put-together for work and school without wearing clothes that highlight this? This question is so relatable, since everyone has those days where the thought of a skin-tight anything makes you cringe. But that doesn’t mean that you have to sacrifice style! Body-con has definitely been seen quite a bit recently, but feeling confident and empowered is so much more important than staying trendy. A huge part of finding your personal style is choosing which trends you want to follow and wearing what makes you the happiest. There are plenty of options out there that are just as stylish without drawing too much attention to any areas that you may be uncomfortable with. If you’re feeling a little self-conscious, look for longer lines that drape and pull away from your body. Finding clothes that are fitted or tailored specifically to you can also help a ton. Below, I’ve put together some outfit options that don’t hug the body tightly, but still give a nice silhouette. Hopefully this will inspire you and give you some outfit ideas! Remember, the most important thing is to accessorize from within with confidence, and then to top it all off with asmile. Enjoy! This outfit is perfect for class or studying in the library. The pleats of the tunic draw the eye in a vertical motion, while the waist belt helps to define a clearer figure. Because the shirt has a natural flow to it, it will hang away from the body and not cling to your midsection. Adding a cardigan will not only keep you warm in chilly classrooms, but will also add a longer visual line to the look. I’m not sure what kind of work you do or what the dress code is like, but this is my idea of a nice business casual outfit that doesn’t draw too much attention to your middle. 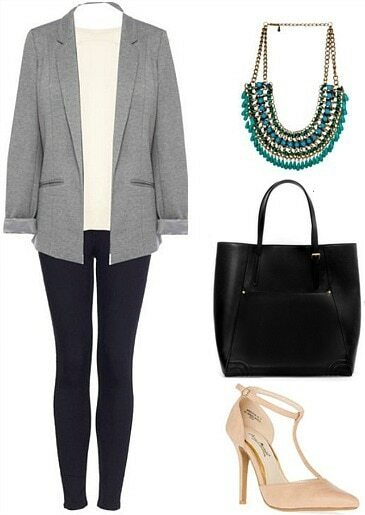 In this outfit, which could also work for an internship, the statement necklace definitely steals the show. The bright pop of color immediately draws the focus upward, while a fitted blazer accentuates the shoulders and automatically creates a loose yet noticeable hourglass shape. Going out is an event in which body-con styles always seem to make an appearance. To change things up a bit, this gorgeous dress has a dramatic neckline and a draped silhouette that will accentuate your shape in a classic way. Personally, I’m a fan of fun tights, and paired with on-trend chunky heels and blingy clutch, you’ll be sure to stand out in a crowd! Do you ever find yourself feeling the same way? Would you wear any of these outfits? Do you like the outfits I picked out? Do you have any other advice to add? Let us know in the comments!